Onions provide many of the same anti-cancer, anti-inflammatory, antibacterial, and cardiovascular benefits as garlic, as well as helping to lower blood sugar. Eating onions just two or three times a week can lower the risk of colon and ovarian cancer significantly (though daily consumption provides the greatest benefits). Onions also help to maintain bone health, and are a source of many nutrients including vitamins B6 and C, dietary fiber, chromium, folate, manganese, molybdenum, potassium, copper, and phosphorus. 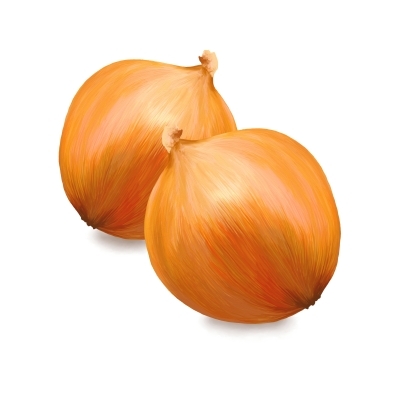 The strongest-smelling onions offer the greatest health benefits. The best choice for health is shallots, followed by yellow and red onions (white onions are lower in antioxidants). As a general rule, the more an onion makes your eyes water, the better it is for your health (pungent onions provide greater benefits than sweet onions). As with other herbs, spices, and produce, raw and fresh provides maximum health benefits. However, many people can’t tolerate raw onions. Research studies have indicated that the beneficial flavonoid quercetin (also found in caffeinated teas and red grapes) isn’t destroyed by most cooking methods, though it is decreased by boiling. However, other compounds may be destroyed by heat, so onions should be cooked just long enough to make them tolerable to preserve as much of their health-promoting phytonutrients as possible. Cutting onions under cold running water is a common strategy for reducing eye irritation, but this can decrease their potency by washing away beneficial phytonutrients. To reduce eye irritation, chill onions in the freezer for 20 minutes before cutting and use a really sharp knife. Although uncut onions should be stored in a cool, dark, dry place, cut onions should be either placed in a sealed container or wrapped tightly in plastic wrap and refrigerated immediately (they will last about a week in the fridge in a sealed container). If cut onions aren’t covered, their nutrient content diminishes rapidly. Cooked onions will last for a few days in the fridge in airtight containers. Plastic or glass containers should be used rather than metal, which can cause discolouration. Onions are quite versatile and can improve most recipes. A particularly healthy salad that provides a good dose of raw onion and plenty of other beneficial phytonutrients is tabouli. To make tabouli salad, mince onion and garlic and set aside. Mix bulgur wheat or couscous and salt in a bowl and add 2 cups boiling water. Allow this mixture to stand for 15-20 minutes or until all the liquid has been absorbed – drain off any excess water. Add all other ingredients. Taste the mixture and add more lemon juice, olive oil, salt, or pepper if needed. This is the sort of recipe that can be easily modified to personal preference by leaving out or adding ingredients, or changing proportions of ingredients. Some people like to add a pinch of cinnamon and/or allspice. For information about growing onions, see Onions: Answers to Frequently Asked Questions About Growing, Storing, and Cooking. For more health articles, visit the main Mind/Body Health page. For more food and drink articles, see the main Nutrition and Food page. Lombard, K., Peffley, E., Gaoffriau, E., Thompson, L., & Herring, A. (2005). “Quercetin in onion (Allium cepa L.) after heat-treatment simulating home preparation.” Journal of Food Composition and Analysis, 18(6), pp. 571-581. The George Mateljan Foundation. (2008). “Onions.” The World’s Healthiest Foods.